Check out Tobi's Out For Tonight Crop Top The Out For Tonight Olive Crop Top features a crew neckline with short sleeves on a soft and stretchy viscose crepe knit! Pair with the Out For Tonight Pants to complete the look! The Out For Tonight Olive Crop Top features a crew neckline with short sleeves on a soft and stretchy viscose crepe knit! Pair with the Out For Tonight Pants to complete the look! 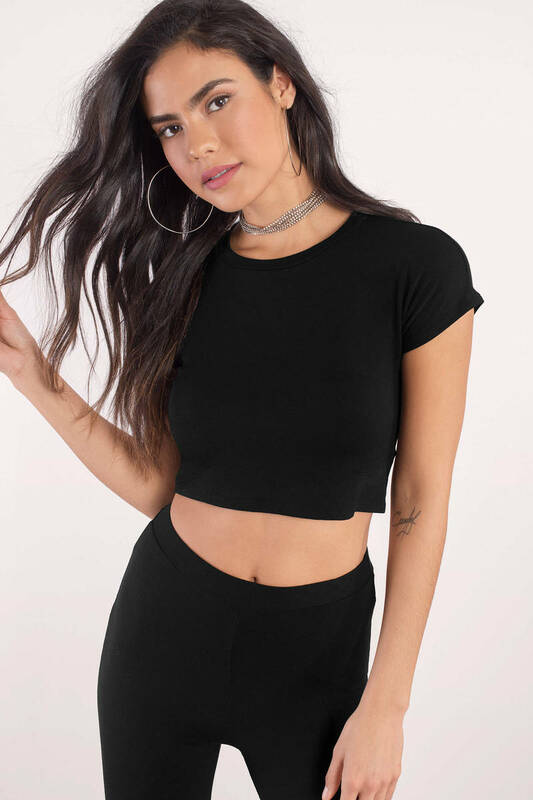 The Out For Tonight Black Crop Top features a crew neckline with short sleeves on a soft and stretchy viscose crepe knit! Pair with the Out For Tonight Pants to complete the look! The Out For Tonight Heather Grey Crop Top features a crew neckline with short sleeves on a soft and stretchy viscose crepe knit! Pair with the Out For Tonight Pants to complete the look! Grey and Black modeled on a size Small.